Stamford Talk: Eat, Think, Drive, Blog! 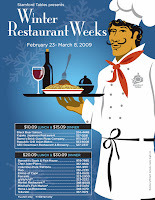 : March Restaurant Weeks: Go Eat! This and next week, Stamford restos offer prix fixe menus. (I pronounce that "pree feeks" OK? That's how the French would say it. Not "price fix" or "pricks fix." ) Click here to see participating restos. Don't bother with the cheap places; those are cheap all the time. Go for a nice place: a few that jump out at me are Market, Duo and Ferrante's. I will warn you, you should look at the price to see if it's worth it. For example, Duo's $30 prix fixe offers two choices for soup/salad: warm mushroom salad or double boiled chicken consomme. I would never purposefully choose either. For entree, they offer oxtail (what is that? ), salmon, and lamb. If you are a chicken/beef person, that might not be your cup of tea. I don't mean to bash Duo; it's one of my favorite restos. But their dinner prix fixe menu does not appeal to me. I don't want you going there for the first time for dinner and getting a bad impression. Instead, try their $20 lunch menu, which looks better- and cheaper! Or, go for dinner and get whatever you like, which probably won't cost you much more than $30. My point is, take a look at the menus on Stamford Downtown's website before you go. For cheaper options, Republic Grill's $15 dinner is not a bad deal, but again, you can get their house salad and pad thai for like, $16 or $17. House salad and mango chicken will usually run you closer to $20, so that's a better deal. Thanks for the heads up! FYI, 'oxtail' is exactly what you think it is: the tail of an ox (or usually in this country, a steer). It's delicious. Hey! Isn't this our one-year anniversary? Didn't we first meet for lunch at Duo during last year's March Restaurant week?